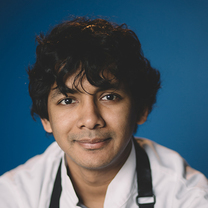 Executive Chef Avishar Barua’s creations are both balance and tribute to his Midwestern upbringing and Bangladeshi roots. His fresh interpretation of familiar flavors is the culmination of an impressive career, with roles at New York’s Mission Chinese and WD-50, and locally at 1808 American Bistro and Veritas. At Service Bar, Chef Barua and his team elegantly translate the foundations of great cuisine into inventive dishes for all to enjoy. "Nutting but a Buckin' Nuts Buckeye. 🥜 🍫 🥃"
"Our Teres Major is middlin' to get a rare peppering of sunlight. Don't look at it that way, it was an honest misteak." "Variety (meats) is the spice of life! Chongqing style sweetbreads "okonomi", ramps, yukons, fried mayonnaise."